View of Robert Indiana, ONE through ZERO. © 2017 Morgan Art Foundation / Artists Rights Society (ARS), New York. Photo by Tom Powel Imaging. Courtesy The Glass House. 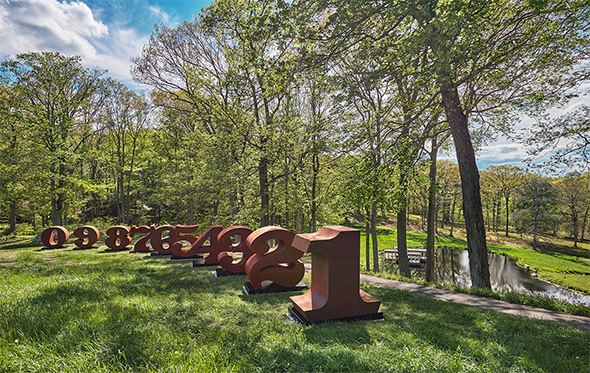 One of the preeminent figures in American art since the 1960s, Robert Indiana has played a central role in the development of assemblage art, hard-edge painting and Pop art. A self-proclaimed “American painter of signs,” Indiana has created a highly original body of work that explores American identity, personal history and the power of abstraction and language, establishing an important legacy that resonates in the work of many contemporary artists who make the written word a central element of their oeuvre. Indiana’s artwork has been featured in numerous solo and group exhibitions around the world, and his works are in the permanent collections of institutions including the Museum of Modern Art and the Whitney Museum of American Art in New York, the National Gallery of Art, the Hirshhorn Museum and Sculpture Garden and the Smithsonian Museum of American Art in Washington, D.C., the Albright-Knox Art Gallery in Buffalo, the San Francisco Museum of Modern Art, the Menil Collection in Houston, the Currier Museum of Art in Manchester, New Hampshire, the Museum Ludwig in Cologne, the Stedelijk van Abbemuseum in Eindhoven, Netherlands, the Museum Ludwig in Vienna, the Shanghai Art Museum in China, and the Israel Museum in Jerusalem. He has also been included in numerous international publications and is the subject of a number of monographs. The Glass House was built between 1949 and 1995 by architect Philip Johnson. The Glass House is a site of the National Trust for Historic Preservation located in New Canaan, CT. The pastoral 49-acre landscape comprises fourteen structures, including the Glass House (1949), and features a permanent collection of 20th century painting and sculpture, along with temporary exhibitions. The tour season runs from May through November and advance reservations are required. For more information, and to purchase tickets, visit www.theglasshouse.org. A tour of the site is included with the cost of admission.